In the past few years, McDonald's has gotten rid of "Super Size," Wendy's has expanded its salad menu - even Taco Bell has created something called the "Fresco Menu." Burger King is giving them all the finger and introducing the Bacon Sundae. 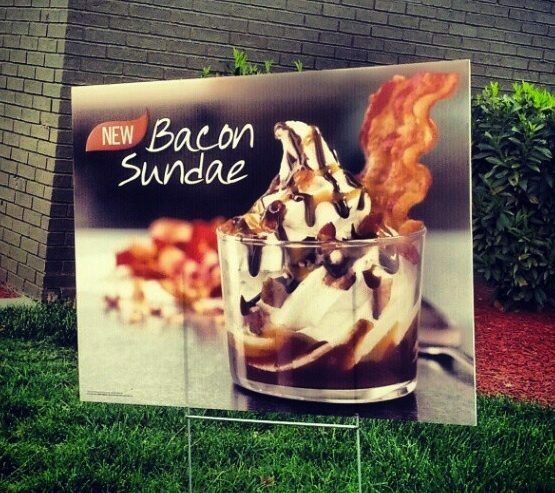 I applaud BK for having the balls to introduce a dish like this during our current "obesity crisis" climate. I believe in the consumer's right to order terribly unhealthy garbage if they're so inclined - mostly because I'm often inclined. Hell, I'll try it. Will you? Forgive me--I never heard about this, so I actually went out to make sure you weren't pulling my leg. The reviews weren't so good, so I'm wondering--what did YOU think of it? I'm new to your blog, enjoying reading!